Look at this Consolidation Volume! 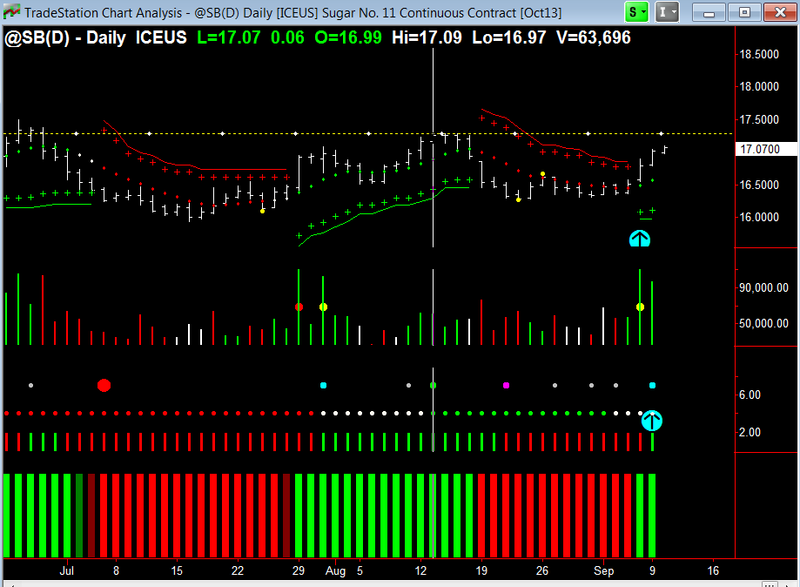 Sugar (SB) is starting to show signs of strength. Last Friday’s volume was the highest volume since June of this year. When you get this strong volume on large up-moves, it is a very positive sign of strength, and could well be the commencement of an uptrend. But, you have to be patient. Looking the the chart below, you can see that there is resistance at $17.50, where the yellow dotted line is. Potential breakout of SB shown by strength of volume and price action. The first cyan arrow up is showing you that there was very high volume. The yellow Hawkeye Volume Radar dot placed on the Hawkeye Volume indicates this high volume event, and the Hawkeye Trend dot changes to green, indicating that at this point an uptrend has begun. The second cyan arrow is displayed on a three-day Hawkeye Roadkill setting. 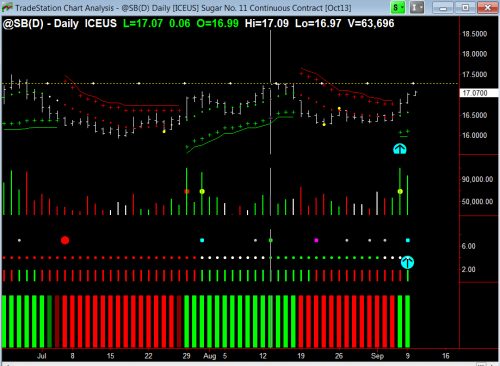 You can see that the white dots (an indication of consolidation in the three-day trend) shows the three-day chart is in consolidation, and the green three-day volume bars show that buying volume has begun. Everything is now virtually in place for a the commencement of a long trend run, but it would have to close above $17.50 to show conviction (the strength needed for continuation beyond the resistance level). We have seen the recent webinar of Hawkeye and is really impressive. Our interest is trading Nifty futures of indian markets on NSEINDIA exchange.some of my friends and myself are interested to see some charts of Hawkeye system on Nifty futures. Appreciate if you can accommodate our request. if you could drop me a line at [email protected] with an indication as to how best we may connect I would be delighted to have a discussion regarding your request. Next PostNext In FOREX, the Fatman is Boss! It Makes Money.